What he needs now is defense lawyer Andy Carpenter, who most definitely is not in the market for a new client. So Noah plays his hole card: a shared love for Andy's golden retriever, Tara, and the knowledge of what her life was like before Andy rescued her. Because Andy wasn't her first owner—Noah rescued Tara first, and when he wasn't able to care for her any longer, he did everything in his power to make sure that she was placed in the right home: Andy's. With that knowledge, Andy has little choice but to take Noah on, and he soon learns that the long-ago event that may destroy Noah's life is only the beginning of an ongoing conspiracy that grows more deadly by the day. 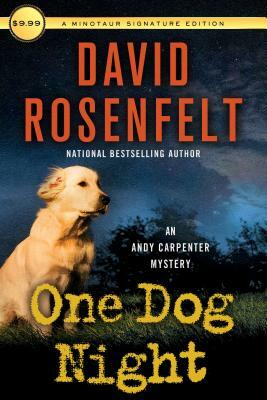 Andy will have to pull out all of his tricks to get to the bottom of this cold case turned white hot in One Dog Night, the latest in David Rosenfelt's popular mystery series.